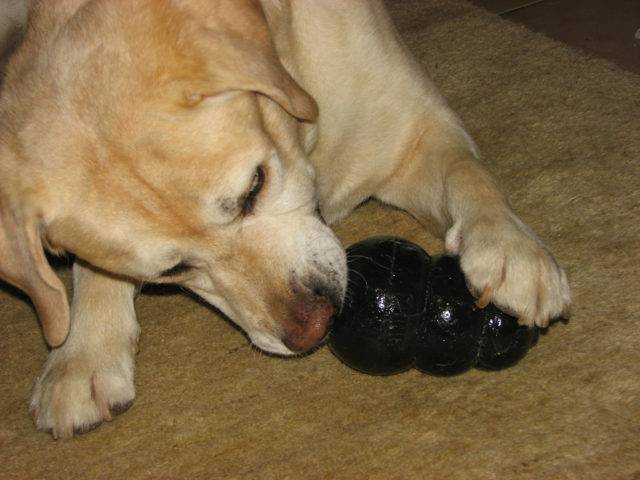 Secrets Of Stuffing A Dog Kong: Try A Variety Of Sticky, Gooey Substances! Whether you’re experimenting with dog Kong toys for the very first time, or you’re just looking for ways to mix things up a bit and make Kongs more exciting for your dog, following are some tips for stuffing the Kong that will come in handy! Depending on how challenging you want the experience to be for your dog, you should include a combination of dry stuffings, soft stuffings, and sticky stuffings inside your dog’s Kong toy. Here are lots of examples of dry stuffings and soft stuffings. The truth is you don’t have to include globs of the peanut butter (or whatever) in order to increase the challenge for your dog. I mean you could, because one degree of challenge is to mix everything up inside the Kong — such that the sticky substance sort of acts like “glue” holding it all together. However, you could just line the inside of the Kong with a thin layer of the peanut butter (or other sticky substance) before putting other things inside as well. Usually, even small amounts of the sticky substance will give your dog something long-lasting to lick and try to remove from the Kong toy. When it lines the entire interior surface of the Kong, the sticky substance may be the last thing that your dog goes after, but you can be assured that it will still take a long time to lick it from all the cracks and crevices inside the dog Kong! If you stuff a dog Kong toy ahead of time, you could also stick it in the freezer — for a few hours, or a few days. That way, you will always have some Kong toys ready (say, before you head out the door) and they’ll be even more challenging for your dog! A frozen dog Kong can take 2 to 3 times longer for your dog to finish than a Kong that’s filled with stuffings at room temperature. Plus, when you freeze Kong toys, you can include some liquid ingredients as well. For example, chicken broth, leftover soup stock, even plain water can be used as the “glue” that holds the hard and/or soft stuffings together inside. Just know that liquid ingredients tend to thaw quickly, so you might want your dog to enjoy these outside, rather than in the house! What Kong Stuffings Do Your Dogs Like Best? My dogs like it best when I put peanut butter in their Kongs. Their favorite dog Kong is when I start with some peanut butter, then add some of their kibble, then a little more peanut butter, and then leave a dog bone sticking out of the large end. Here’s the best way to clean dog Kong toys!